Professor Teresita Levy recently returned to Cuba for a third time since 2015, in a continuing effort to create Lehman College partnerships with the island’s most prominent universities. Levy, the director of international programs and global partnerships at the College and an associate professor in the Latin American, Latino and Puerto Rican Studies department, says that on the most recent trip between October 22 and November 4, she established relationships with the University of Camagüey (UC) and University of Sancti Spiritus (UNISS), that could lead to the first partnerships with Lehman by January 2018. The goal of the partnerships is to create classes accessible to both Lehman and Cuban students, and to pave the way for educational travel to the island for Lehman students. 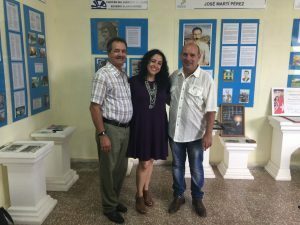 Laying the groundwork for these partnerships began last February, when Levy attended “Universidad 2016,” a five day international higher education conference in Havana, where she met officials from UNISS and UC. Lehman signed letters of intent with the universities; informal agreements acknowledging mutual interest. The paper described the American and Cuban education systems, focusing on points of common interest. Levy and Román Cao were invited to present their findings, at an international education conference in Cienfuegos. Levy made several dynamic presentations at UNISS and UC; the first about Lehman College; the second about her book “Puerto Ricans in the Empire: Tobacco Growers and U.S. Colonialism”; the third about about the Latino vote and 2016 presidential elections. “I was the first U.S. academic ever in their university and they were so excited about it ,” says Levy about her reception at UNISS. The specifics of the projects and the possible starting dates are still being worked out but Levy believes that the Lehman partnership with UNISS, could begin by January 2018 , while a project with UC, would be launched at a later date. The first possible partnership would be a collaboration between Lehman and the UNISS School of Education. The project would have a working faculty team of six professors (three from Lehman and three from UNISS) that will prepare three courses in three different disciplines. One potential class being considered is the “impact of education on culture and society.” The course would be offered online at both schools and would culminate with a one week visit to the UNISS where students and faculty would meet and work together. At UC, an interdisciplinary research project will be developed that will tap into that university’s interest in local development and could potentially partner with Lehman faculty in health sciences, history, the arts and education. “Students could serve as research assistants and would be taught both quantitative and qualitative research methodologies, depending on the professors that would ultimately participate in the project,” says Levy. Levy will be returning to Cuba in February 2017 where more specific details of the partnerships will be discussed.